hi looking for info about Overbrook Philadelphia . house prices ( 4/5 BR) , kosher food, frum schools, shuls, how many frum ppl living there , what type , chassisim , litvish, chabad . and in general the quality of life there . Do you actually mean Overbrook? As in "In West Philadelphia born and raised ...."? The last Jew there was probably my father, and that's 20 years ago at this point. There hasn't been a Jewish community there since the early 60s, at the latest. I probably got the name wrong , the place where the supermarket house of kosher is please . I believe that would be considered Overbrook Farms. I had no idea there was a difference! Interesting. I guess no one adds the farms part when they say where they live. I have a bunch of friends that lives by drexel and they call it overbrook. OP, unless your part of the Yeshiva I wouldn't recommend moving there. Lower Merion sounds like a better fit. I like the first pic ! so.... any info regarding kosher , ppl , shuls , housing ? But the supermarket you mention is in the Northeast (not sure what section it would be called), which is the other side of the city. Maybe start a new thread. Overbook Park has always had a frum population here. It is steadily becoming more Chabad. There is a Lubavitch shul, an MO shul, several supermarkets with kosher delis and bakeries. There is a Chabad cheder, a yeshivish elementary school in Northeast Philly and a mainstream Orthodox school in the suburbs. Overbrook Park is picking up in popularity with some New York crowds. Cheap real estate and growing Lubavitch population. The House of Kosher is currently trying to move over to our area (Western suburbs). Many of us make the trip once a week to H.O.K because of the variety of foods there. We also have a beis Yaakov-type high school for girls and an all boys main stream high school for boys. Overbrook Park is the name of the area that is experiencing a frum renewal of late. 3-4 bedroom townhomes (called row homes in Philly) are selling for between $150,000 to $200,000. front yard, some with back yards, too. the more expensive ones have been renovated (flipped), which is a very popular thing for this neighborhood. Most of the 18-20 new families are Chabad. Within close walking distance is a Chabad shul and a mainstream/MO shul. Pizza, bakery and bagels are in Overbrook Park. Overbrook Park is part of the city of Philadelphia--and one big benefit is a tuition break at the frum schools for Philly residents. Across the closeby county line, into the suburbs, is Wynnewood, where the homes are single homes or 2 family homes (twins), ranging from $350,000 to $500,000. No Philly tuition break, either. A close 10 minute drive gets you to Bala Cynwyd and Lower Merion--which is walkable in about 45 minutes. That's where the bulk of frum Jews live. expensive real estate. beautiful area, though, if you can afford it. Several restaurants, supermarket, kollel are in that area. also mikveh is in Bala. Overbrook Park is a phenomenal place for people looking for a heimish, supportive community, with very reasonable real estate. Come join us!! also--in the first photo of Overbrook Farms--there are very, very large homes (5-8 bedrooms) for a fraction of what it would cost in the suburbs. it's an historic neighborhood, built around 100 years ago majestic, well-kept homes. 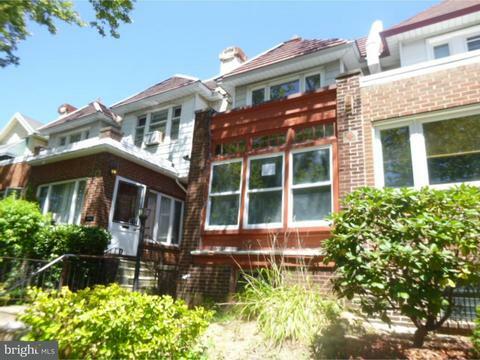 and only 5 minute walk from Overbrook Park. Philly Yeshiva is a few more blocks further. I no longer live in Philly, so that's interesting to me. Overbrook Park was largely Jewish when I was a kid, back on the paleolithic era, and the houses are virtual doppelgangers for the house I grew up in. Tiny bathrooms, but eat in kitchens. Glad to hear its having a resurgence. Brooklyn is a lot more confusing than Philly. Why dont more people move to Baltimore? Philly? Or farther?